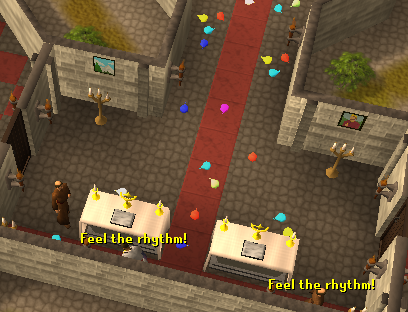 Begin by speaking to Brother Omad in the monastery south of Ardougne. Firstly, talk with Brother Omad. He can be found in the Monastery just south of Ardougne, and he complains of a crying child that won't let him sleep because the child's favorite blanket has been stolen. You will need to retrieve the Blanket from the Thieves, who are hiding in a secret hideout near the Monastery and Clock Tower. 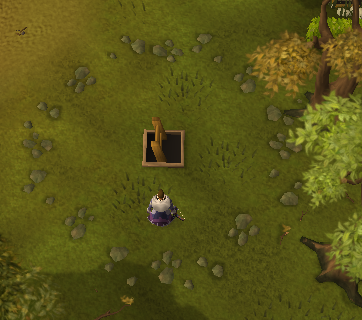 Just south of the Clock Tower should be a ring of stones, and once you step inside of them a ladder will appear! Climb down the ladder into the hideout and head into the main room where the Thieves are. Take the blanket from the table while defending against the Thieves if you need to, and then go back to Brother Omad. 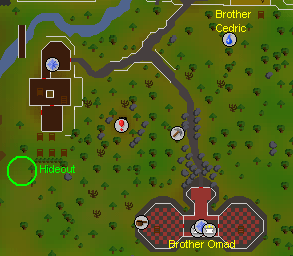 Head north of the monastery to find Brother Cedric, just south of the Ardougne Zoo. He's drunk (of course) and he needs water to wake up. If you have an empty jug, go the the Khazard Fight Arena houses located south of the Monastery and fill it with water from the sinks. Once you give him a jug of water, he needs wood to fix the broken cart. Give him a set of logs and then head back to Brother Omad, and party time! You can burst the balloons, but there won't be anything inside. 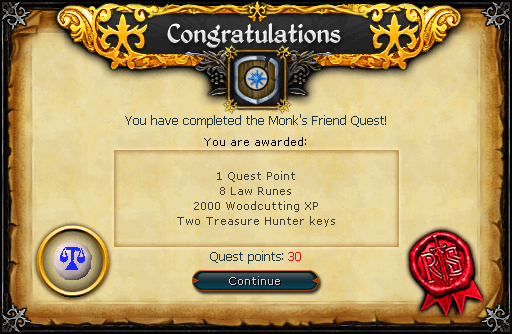 8 Law Runes 2,000 Woodcutting experience Ability to throw mini parties in the Monastery by talking to the brothers.